Spring Time Die Cut Art - and Guest Designing at Frilly And Funkie! Hello everyone! Guess what?! I have been invited to play along today as a Guest DT over at Frilly and Funkie Challenge Blog, after my altered ahabby chic dress form was voted the winner of the Bring on the Bling challenge! How exciting is that?! I was even more excited when I found out the theme of their current challenge - Spring Time Die Cuts. I love spring and I have recently rediscovered my love of die cutting (getting a new die cutting machine might have something to do with it lol). So... my crafty offering today is a card with a soft colour palette, inspired by the glorious blooms of my neighbours' magnolia tree. Dusky pinks, golden yellows and soft browns seem to have taken the centre stage. This is my early spring take on the challenge theme, before the fresh greens take over :). 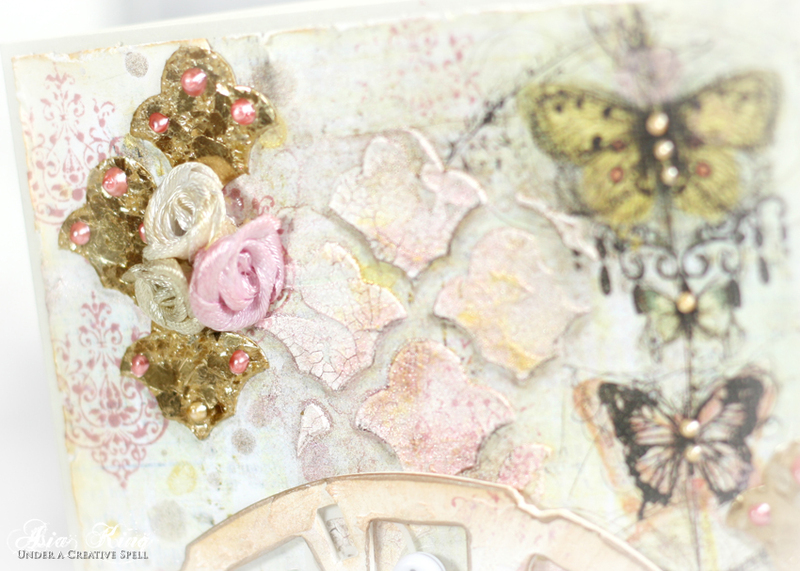 In my card I used Spellbinders Grateful Lattice die and Sizzix Tim Holtz Picture Wheel die. My Grateful Lattice die cut was first used as a stencil for a thin layer of DecoArt Texture Crackle. I also threw in a few individual lattice elements that I had left over from my vintage rose trellis card. The lattice elements are covered with beautiful and sparkly Stampendous Gilded Mica Fragments. Using Grateful Lattice die to add texture to my background. The papers are from Prima Marketing (Striking Appearance, Epiphany Collection, which I used in my shabby birds' nest ATB) and 7Dots Studio (Dreamer collection). All quickly put together with MyStik® Permanent Strips. I also added some stamping using Stampendous Charmed Art and Vintage Lowercase Perfectly Clear stamps. The picture wheel was also brushed with the Texture Crackle, then rubbed with the mica powders. I backed it up with some florist's cellophane that had a lovely white print on it - my Adhesive Sheets were perfect for this job. After popping the wheel over some The transparency gave my alpha beads (thrift shop find) an interesting floating appearance. Using transparencies to add depth and give the alphas a floating appearance. I have lots of mica sparkliness going on in the background, too. For that I used the new mica powders (Pink, Brown and Gold) from Donna Salazar for Scrapbook Adhesives by 3L® (available soon!). To finish the card I added some Liquid Pearls, ribbon and ribbon roses died with DIY mica sprays I made using the the mica powders. Thank you so much to Linda and the Frilly & Funkie Team for inviting me to play along with this challenge! I feel truly honoured! Thank you for stopping by and I hope you will join us for this Spring Time Die Cuts Challenge! Really beautiful project, love the colours and textures. Congrats on your GDT position. This is absolutely stunning, Joanna.. I'm trying to take it all in..the colors...textures... Congratulations on your invitation and your dress form winning first! You are so talented. Thank you for sharing your lovely art and best wishes for a happy Thursday! The detail is exquisite, dear Asia! You never cease to amaze me with your beautiful creations. Wow!!! Great work, your canvas is fantastic!! Thank you for joining the Mixed Media Place challenge! amazing! your work is very interesting and unusual! Super cool! Thank you for playing with us at 7Dots Studio! Your things are great, A challenge is alway fun . An absolutely gorgeous piece of work, Joanna. Like everyone else, I'm captivated by it. So much to take in - gorgeous colors, fantastic textures, beautiful bits of vintage yumminess! A perfect piece of eye candy for our visitors to drool over at Frilly and Funkie. Thank you for providing such a spectacular piece as our guest designer for this challenge. Congratulations too on the win last time around. Your dress form was a triumph! Wow! You have really done a great job for your Frilly and Funkie GDT spot! Congratulations, and even more so, thank you for sharing this lovely card! Breathtaking! An amazing full of textures and lovely details card... So much to discover! Thanks for joining us at Our Creative Corner! hello Asia! wow, gorgeous card, luv the embellies....awesome! so glad you played along with Simon Says Stamp Wednesday Challenge! Thanks for playing with MMP challenge! So beautiful! Thank you for joining the Mixed Media Place Gym! What a lovely spring creation Asia! 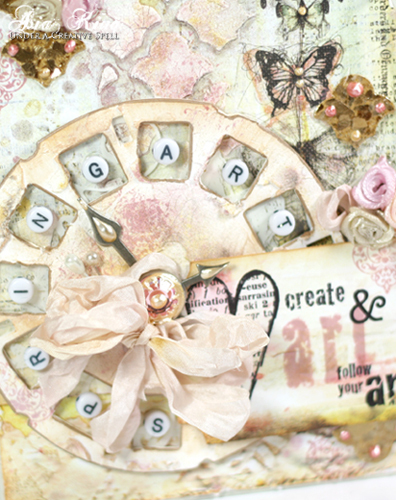 love the pasted stencil - the ribbon - touches of gold - and the fun photo wheel with the acetate and letters! Thank you so much for joining us in the A Vintage Journey Through the Looking glass challenge! Hello again, Asia! I'm SO glad you accepted my invitation to come by and share your AMAZING art in our challenge. It's a blessing to have you play along with us, and I hope that you will join us again soon. I just LOVE your style of crafting. What a great take on the challenge. So creative : ) I love it! Thanks for playing along with us at Really Reasonable Ribbon! Lovely project!! thanks for joining at 7 Dots Studio! Hi Joanna; such a pretty and romantic card! 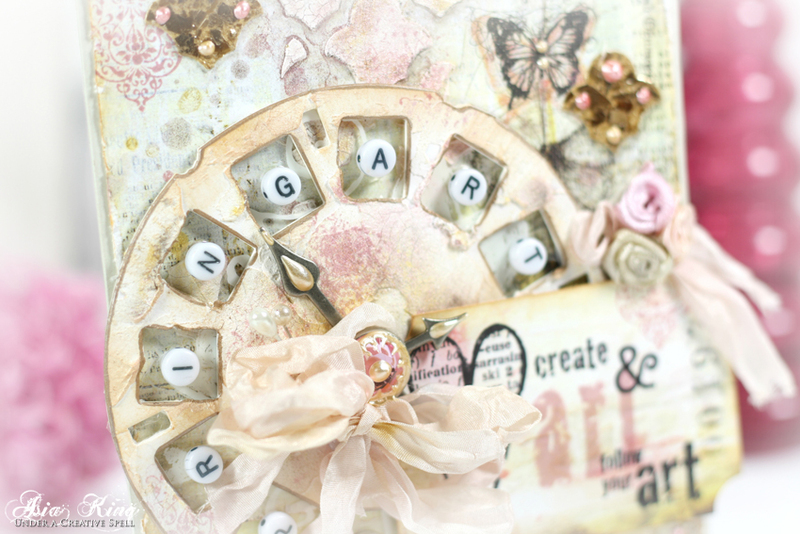 Gorgeous soft tones, great texture and I love the wheel with the wording. Simply Brilliant! Thanks for joining LLC this month. 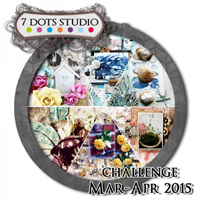 Amazingl canvas !Thank You for joining us at 7 Dots Studio challenge this month !